Mid-Spring 1911 Butler Bros. Catalog. MAPLE LEAF Butter in Marigold. 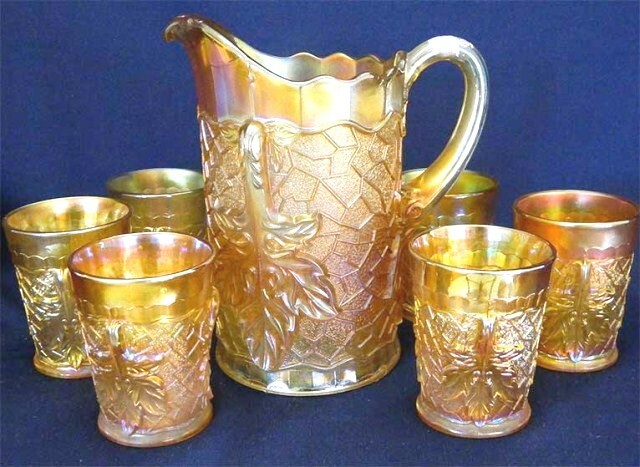 MAPLE LEAF Water Set in Marigold. 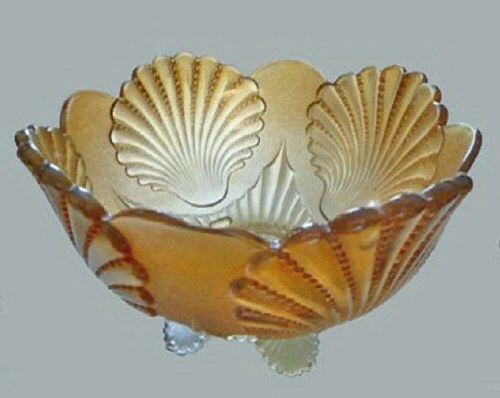 MAPLE LEAF - Marigold: The 1910-1911 carnival glass versions of this pattern were made by Dugan, from moulds left behind by Northwood in the late 1890s. Diamond continued production of the pattern from 1913 into 1928. Carnival shapes were limited to the berry set, table set, and water set. One small bowl has been found in green, the standard colors for all three sets are: marigold, amethyst, oxblood, and cobalt blue……..and yes, that actually IS an oak leaf, but since the name Maple Leaf has prevailed for more than century, we might conclude it to be “acceptable”. Ad for NEW Mosser Maple Leaf Glassware. 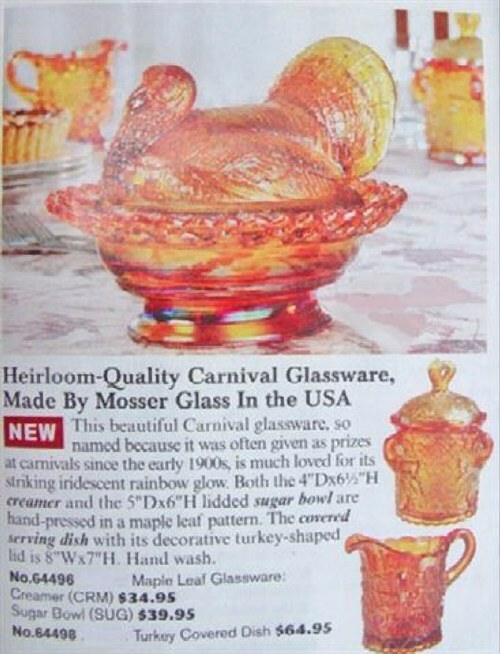 Mosser MAPLE LEAF Reproductions: This ad appears in a catalog we receive from a Vermont store. 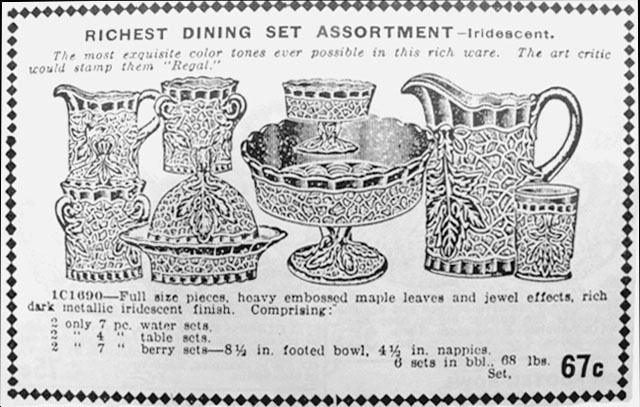 Clicking into Mosser Products on the computer will display for you the complete water set and table set which are being reproduced currently (Oct. 2013) in the Maple Leaf design. 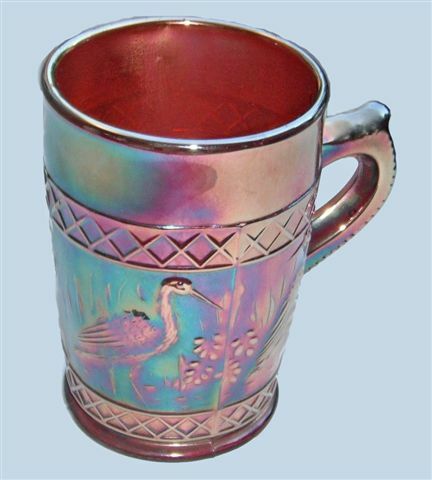 (Diamond) STORK in RUSHES Mug - Amthyst - Scarce color. STORK in RUSHES Mug: We compiled extensive information surrounding this pattern as long ago as 2004. You will find STORK in RUSHES DILEMMA listed on our homepage. At that time we lacked a photo of the amethyst mug. Although marigold mugs are familiar to most collectors, more serious concentration and effort is required to locate a nice example in amethyst! The reason this mug shape was produced in a wide spectrum of colors is curious! Cobalt blue examples are considered rare, lavender is scarce, as well as aqua base w/marigold overlay and light blue w/marigold overlay. FEATHER SCROLL: The fact that this sugar is Blessed with a lid, “possibly” indicates it to be a reproduction? Much controversy surrounding this piece has existed for decades. There is one known sugar base in marigold, having no lid, which is said to predate any known reproductions of the pattern. Is this example having a lid, a repro.? It’s up to you to decide. You may read more about this pattern and its line of reproductions by going to our DUGAN – PART 1. Known tumbler reproductions began as long ago as 1969 with St. Clair. (Dugan) MANY FRUITS Punch Bowl in Amethyst. MANY FRUITS Punch Bowl: Although marigold and amethyst sets are shown/discussed in PUNCH SETS - Part 2, along with a white set in PUNCH SETS – Part 6, when we discovered this cracked bowl for sale at a local auction house, we decided to provide pictures of the lovely and detailed designs displayed in the elaborate bowl! It must have provided a desired effect when displayed at the 1911 annual Pittsburgh Glass Exhibition. 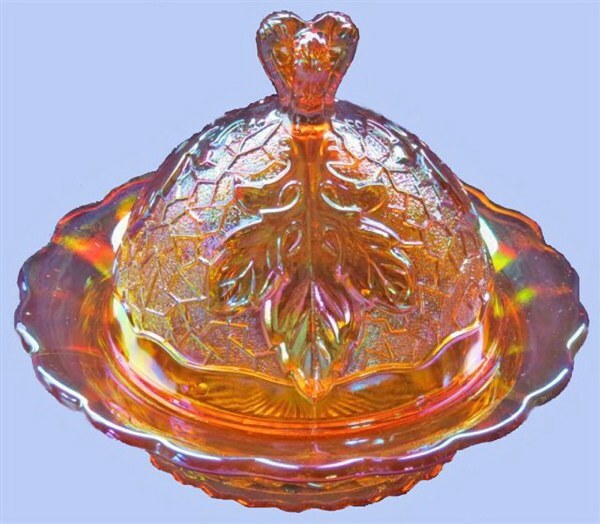 The trade journal reporter stated that “The high foot of the punch bowl is reversible.”……..thereby creating a compote! Dugan put their best efforts forward on this set. 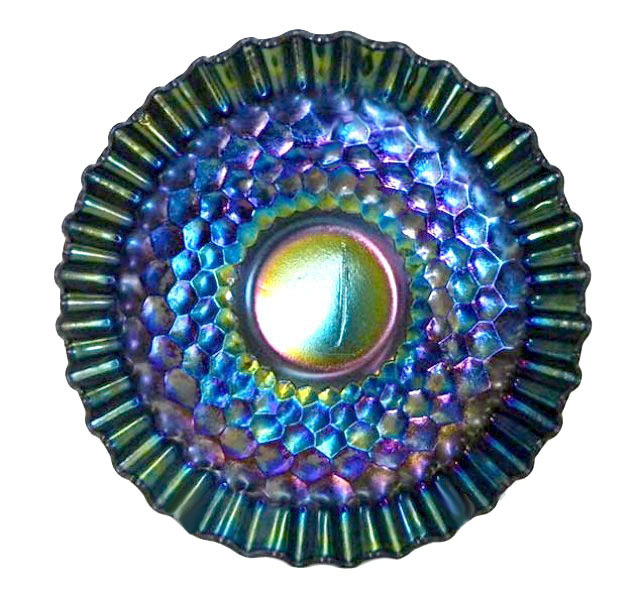 BEADED SHELL Bowl - 9 in. x 5.75 in. - Marigold. Beaded Shell Butter Dish - Marigold. 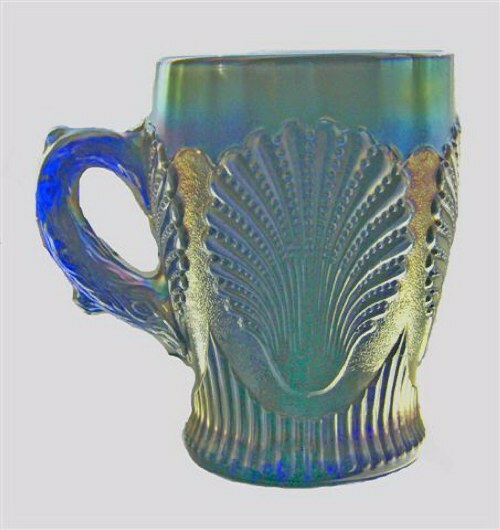 BEADED SHELL Mug - Blue (Dugan). 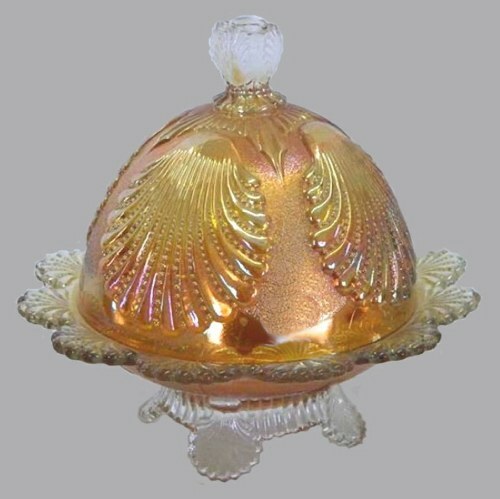 BEADED SHELL Bowl and Butter Dish: Introduced in non-iridized colored glass in 1903. The iridized version probably went into production around 1910, with examples appearing in wholesale catalogs through 1916. Berry sets and table sets in marigold and amethyst, along with water sets in marigold, amethyst and cobalt blue exist, along with an occasional lavender tumbler. Handled mugs are found in marigold, amethyst, cobalt blue, lavender, and white. As you can imagine, cobalt and lavender examples are quite scarce. White mugs are very rare! HARVEST FLOWER Water Set in Marigold. HARVEST FLOWER Water Set: Many years of effort to provide conclusive evidence of manufacture by either Dugan or Diamond proved fruitless. Wholesale catalogs offer no clue. Since so few examples are known, one might conclude this to be a Diamond design which was instigated late in the era, prior to the factory demise. Extremely rare water sets are the only known shape within the pattern! Pitchers have been found only in marigold. 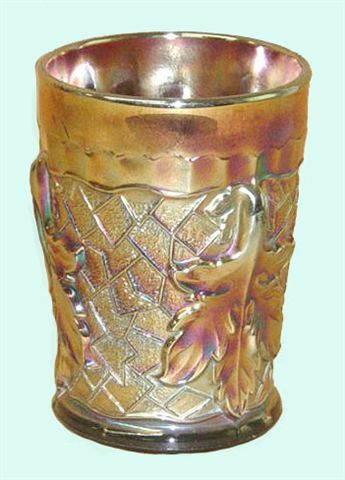 Tumblers are known in marigold, amethyst, and some in light green with marigold overlay. L.G. Wright purchased the original moulds in Indiana, PA and issued a reproduction of the water set in the 1980s. 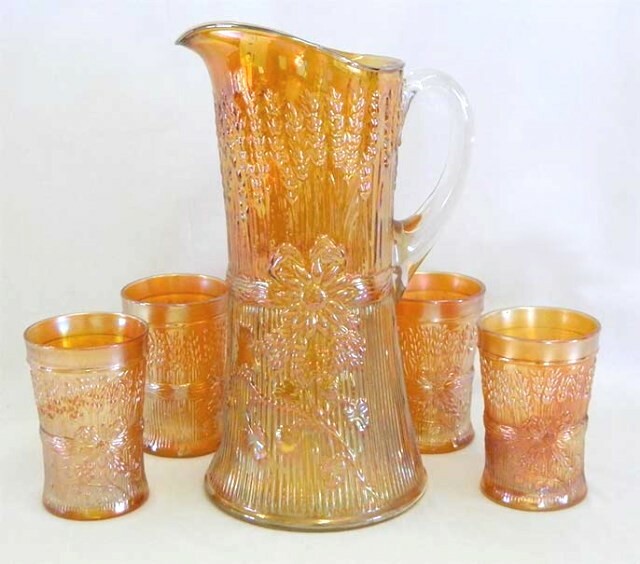 Carl Burns noted a gaudy red carnival glass water set was reproduced by Westmoreland for L.G. Wright in the late 1970s-early 1980s. Amethyst HONEYCOMB 7 in. Plate. HONEYCOMB Plate: These 7”-7 ½” Dugan plates nearly always have a tightly crimped edge. 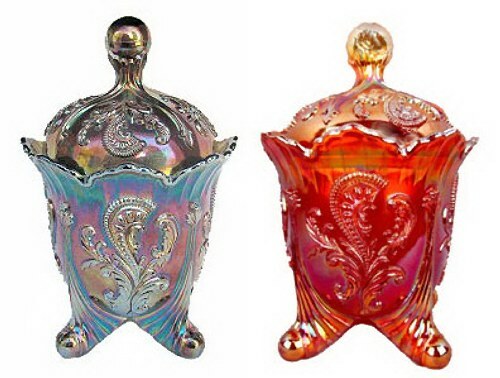 They date from 1909-1911 and are known in marigold, amethyst, peach opalescent and oxblood. Exteriors can be plain or have a Flowers and Beads design. I will lift up my eyes to the hills…..from whence cometh my help? Psalm 121 is an affirmation of confidence that God will watch over Israel and shelter His people from harm. A rising wave of praise can draw believers into God’s presence in a special way.